The Bureau of Labor Statistics projects that career opportunities for web development professionals will increase by 13% between now and 2026. Even though that’s faster than average growth, it still means you’re going to face tough competition for jobs in your field. Since your resume can make or break your chances, you need to design a stellar document that calls attention to your strongest relevant qualifications. We offer many tools to help you land your next job, including professional resume templates in a wide variety of visual formatting styles. Use our web designer resume templates to format your document with an effective layout as well as strategically compose and organize your text. 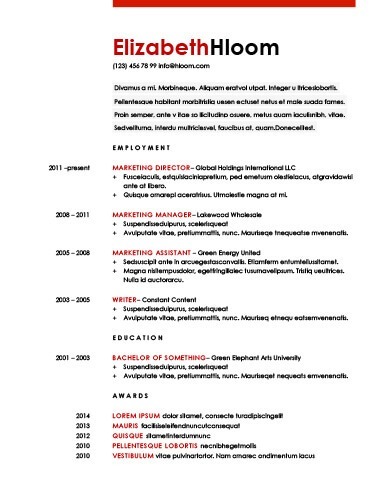 Why Use Web Designer Resume Templates? Web design is a creative field, so your resume should reflect solid design principles, a well-ordered structure, and enhanced visual appeal. The very nature of your profession demands that you step up your game when it comes to crafting this document’s aesthetics, but you’ve also got to pay attention to its content. Besides the presence of application tracking systems, there are other good reasons to choose a simple layout. Since hiring managers only spend an average of six seconds perusing each resume, you don’t want to adopt elaborate formatting that makes your qualifications hard to find. Our basic and simple web designer resume templates give you pointers for utilizing concise language in an uncluttered yet dynamic layout. You need every advantage you can get when you’re an emerging professional looking for work in your field. New jobseekers should take a look at our entry-level web designer resume templates for tips on clean, elegant formatting that calls attention to the experience you’ve gained during prior internships, volunteer work, and other unpaid positions in your career history. Our creative web designer resume templates allow you to demonstrate your design and layout skills right out of the gate. Meanwhile, you’ll also learn how to prudently choose your color and graphics schemes as well as write compelling, organized content. Remember to match up the aesthetic of your resume to your target employer. Clean, minimalist looks are ideal for more conservative firms, while quirkier approaches are great for innovative companies. Creatively styled resumes can showcase your relevant talents, but an even more contemporary approach can take this a step further by employing visual storytelling in a unique, high-impact format. Our infographic web designer resume templates show how effective design principles yield a visually bold document that uses color wisely, is easy to read, and quickly emphasizes your strongest qualifications. Don’t forget to craft a traditional text-only version as a backup. Modern recruiters nowadays rely on application tracking systems to help them sift through the onslaught of job applicants. These tools scan incoming resumes for keywords from the original job posting and then score each document for relevance. With our ATS web designer resume templates, you’ll discover keyword optimization layout tactics that can get your resume past the bot and into recruiters’ inboxes. Selecting a first-class format from among our web designer resume templates is a great beginning step. At the same time, you also need to compose compelling text for your resume. You should find the following advice useful for crafting and polishing each section of your document. Name: Keep in mind that you’re not limited to using your full legal name. If yours is fairly common, feel free to differentiate it by including middle initials or a shortened form of your first name. Whatever moniker you use, keep it consistent with your professional social media profiles. Email address: Pick a username that’s a variation of your own name, and avoid "dated" email servers such as AOL and Hotmail. Phone number: Whether you list a home or cell phone number, don’t forget to record a professional-sounding voicemail greeting. Mailing address: Avoid identity theft by only including your city and state. In times past, an objective statement was a standard inclusion in one’s resume. Nowadays, professional summaries are the favored way to start off these documents. Which one is right for you? You’ll need to make that call, but there are definite advantages to each type of statement. Summary Statement: This statement can serve as a strong, opening sales pitch for your career "brand." Hone yours into a concise paragraph, limiting it to around three sentences or bullet points that contain your most formidable and relevant qualifications. Objective Statement: Entry-level jobseekers and those switching careers can get great use out of a well-crafted objective statement. To make sure it doesn’t veer into cliché territory, steer clear of generics and go for specifics. You should state exactly how you’ll leverage your unique skills and expertise, and in what role you see yourself bringing value to an employer. Phrasing Is Everything: Scan each job posting and select explicit keyword phrases that match your own skills. Keep It Clean: Format your list using four to six bullet point statements. Target Your List: Custom-tailor your skills section to each new position you apply for. Accomplishments: Brag about achievements that improved efficiency or saved money, and include quantifiable metrics when possible. Paint a Picture: Dynamic action verbs show hiring managers what you did in better detail than sticking to generic language. If you need help with word choice, this list of possibilities can make your resume shine. Reverse Chronological Order: Start with your most recent schooling experience and work backwards from there. List Your Certifications: Don’t overlook any training courses, technical certifications, or other educational credits. Start today with our resume builder for these and other great benefits. Just select your favorite design and input some information about yourself. We’ll recommend the right template for your document, along with indispensable industry-relevant advice.